You are here: Home / Therachat Updates / Therachat Mobile App For Counselors & Psychologists Has Arrived! I am very excited to announce we just released a stand alone Mobile App for Counselors and Psychologists on iOS and Android! While building Therachat on the web, we slowly figured out that counselors and psychologists, like yourself, are very busy. You want to be able to follow up with your therapy clients on the go and you want to be immediately notified when your client needs you. 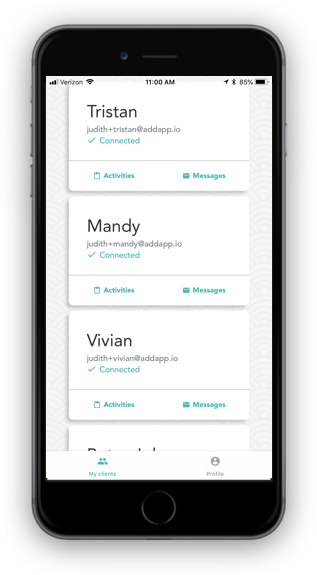 We received constant suggestions for the conception of a mobile app designed specifically for counselors, but at the time we just didn’t have the bandwidth to do so. As a temporary solution, we optimized our web dashboard to be more mobile-friendly. But it wasn’t enough. We weren’t able to reap the benefits of mobile apps, such as sending you notifications when your therapy clients messaged you. Two months ago I challenged myself to draft a first version of the mobile app for counselors and psychologists together over a weekend, outside of my hours at work. I didn’t spend any time designing it, and it only offered 20% of the features we have on our web dashboard: the ability to send/receive HIPAA-compliant messages and the ability to view results of homework activities. Although it lacked a lot of the core functionality the web dashboard offered, the important thing was it was there. So we decided to release it to a small group of beta testers: our community of Therachat ambassadors. The feedback was stellar, but there was a lot of subsequent confusion following questions like “Why am I downloading the client app?” and “Where in the App Store listing does it say this app is for clinicians?”. In the meantime, we also added more features to the Therachat mobile app for all of our users. So… long story short: we decided decided the time is perfect to release a separate, standalone Therachat mobile app for counselors and psychologists. With Therachat you can read and send messages to your therapy clients. All in a completely HIPAA-secure environment. Therachat comes with a library of clinical, evidence-based, engaging homework activities you can schedule for your clients. Homework compliance increases with 80% when using Therachat with clients. Why wait? Through the mobile app you can easily follow up on your clients’ homework results. 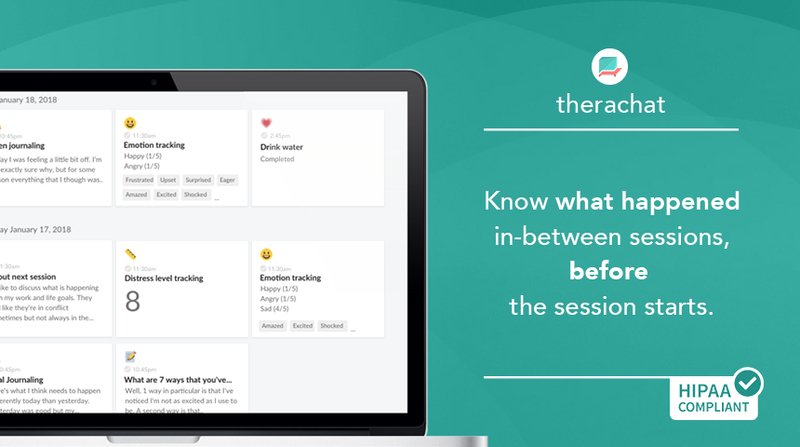 Invite your therapy clients to use Therachat with a simple click of a button. You can download the app on iOS and Android for free and try it out for 7 days. During those 7 days you also have full access to the web and mobile platforms. After 7 days you will be prompted to subscribe to keep using it. The standalone app and all its new features are part of the Therachat PRO plan. If you’re not subscribed to PRO plan yet, you can easily upgrade to the PRO plan in the profile section of the dashboard. When you do so, you will have access to the mobile app.